Blueys Retreat, a short stroll from Blueys Beach, is an eco-tourism development on the NSW mid-North Coast, in the Great Lakes local government area. Blueys Retreat is a luxury boutique ‘village’ providing accommodation in two/three bedroom fully-appointed (detached and semi-detached) houses. 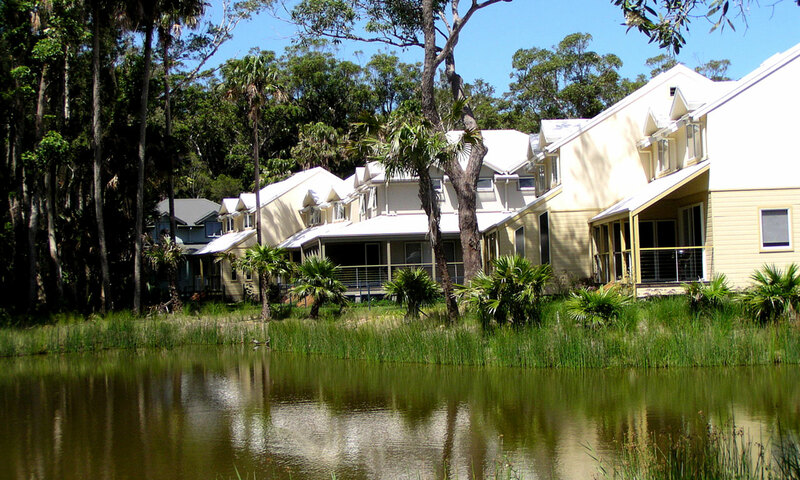 Located adjacent to a magnificent wetlands area, dominated by tall Paperbark trees and Cabbage Tree palms, Blueys was developed by Ian and Jan McLean, the passionate, determined and forward-thinking long-time owners of the property. Ian and Jan engaged ourselves as their landscape architects and environmental planners in the very early stages of the project, and we felt privileged to be working with them on the master planning of such an exciting project in such an environmentally sensitive area. The complete site has an area of 6.22 hectares, however approximately 2.87 hectares of this land had been cleared for farming in the late 1940s. It was this cleared area that was used for the development of Blueys Retreat, with the balance of the land being set aside and re-zoned (at the McLeans’ request) for conservation purposes. After much hard work and persistence by Ian and Jan, their dream looked like it could actually become reality when the Design Report, prepared by ourselves in conjunction with Wolski Lycenko and Brecknock, the project’s architects, was approved by Council, meaning that the rezoning could take place. The 29 low impact buildings are set around a constructed wetland/OSD ‘water quality’ lake, designed by ourselves as an integral natural landscape feature within the resort. The surrounds of the lake were planted out with endemic macrophytic plants, designed by us to not only stabilise and beautify the lake surrounds but to also create habitats for many of the water birds that soon took up residence. The development also includes a large swimming pool, designed to appear as if it spills over into the adjacent lake, plus adjacent poolside areas and spa, together with a tennis court, club house and café/restaurant. The overall development was designed to provide high quality facilities in a largely natural environment, ensuring at the same time that the environmental impact of the development was kept to an absolute minimum. In addition, a Landscape Management Plan was prepared for the village itself, including the lake and common areas, together with guidelines on how to best manage the adjacent conservation-zoned section of the property.